(Rome) "Catholic Church Quo Vadis?" 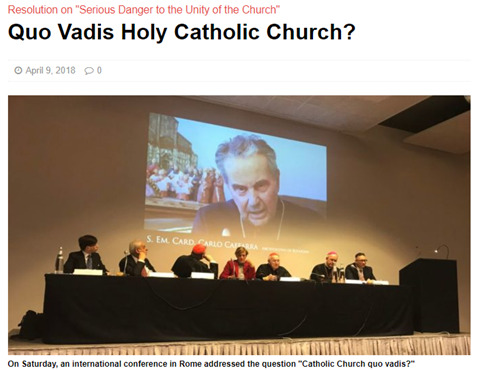 Was the theme of an international meeting that took place in Rome last Saturday, 7 April. Speakers included the two signatories of Dubia to the controversial post-Synodal letter Amoris laetitia , Cardinal Walter Brandmüller and Cardinal Raymond Burke, and the internationally renowned Bishop Athanasius Schneider. The aim of the conference was to take stock of the current state of the church and how it should proceed in the contentious issue. To this end, the participants published the following resolution. In the face of contradictory interpretations of the Apostolic Exhortation "Amoris laetitia", growing worldwide confusion and confusion spread among the faithful. The urgent request of nearly one million believers, more than 250 scholars, and even cardinals for a clarifying answer from the Holy Father to these questions has not been answered to this day. In this grave danger to the faith and unity of the Church we know, baptized and confirmed members of the people of God, called to confess our Catholic faith. Vatican II empowers and encourages us, as stated in Lumen gentium, n. 33: "Thus every layman, by virtue of the gifts given to him, is at the same time a witness and living instrument of the mission of the Church, even according to the measure of the gift of Christ (Eph 4.7). " We are also encouraged to do so by the blessed John Henry Newman, who, as early as 1859 , in his prophetic scripture " On Consulting the Faithful in Matter of Doctrine, " pointed to the importance of the lay faith witness. The validly concluded and executed marriage between two baptized partners can only be resolved by death. For this reason, married Christians, who nevertheless associate with another person during their spouse's lifetime, commit the grave sin of adultery. We are convinced that there are absolute moral commandments that always and without exception oblige. We are also convinced that no subjective judgment of conscience can make an intrinsically evil act good and licit. We are convinced that the judgment as to whether sacramental absolution can be given or not depends in no way on the culpability of the sin committed, but on the willingness to live in accordance with the commandment of God in the future. We are convinced that remarried divorcees who are unwilling to live like brothers and sisters in the future are in objective contradiction to God's commandments and therefore cannot receive Eucharistic Communion. Our Lord Jesus Christ says, "If you remain in my word, you are truly my disciples. Then you will know the truth and the truth will set you free "(Jn 8:32). In this confidence, we confess our faith to the Supreme Pastor and teacher of the Church, together with the bishops, and ask them to strengthen us in their faith.